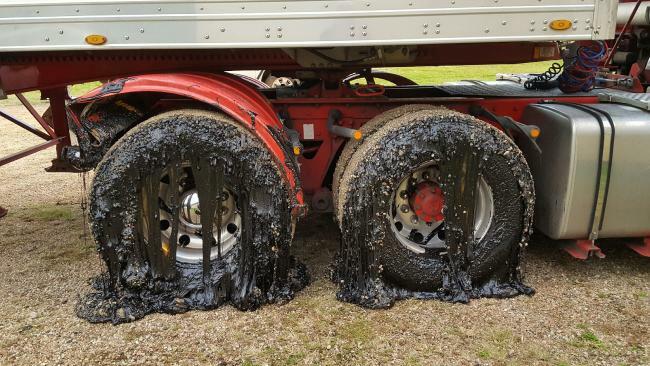 A truck driver was forced to abandon his vehicle outside the Jaggan Hall after the tyres were gummed up with tar driving along Millaa Millaa Road. MELTING tarmac on a far north Queensland road has gummed up tyres so badly motorists have been forced to abandon their vehicles. Tarmac melted on Millaa Millaa-Malanda Road in Tarzali, an hour and a half south of Cairns, leaving motorists stuck. The road has been unsafe since a reseal job last week was ruined by wet weather, causing the bitumen to become loose and cracked. According to Jaggan resident Deborah Stacey, the moment the sun came out around midday today, the bitumen turned to glue. "There was emulsion everywhere; a lot of soft tar sprayed in big globs and sticking to trucks wheels," she said. "We had a week of cracked windscreens, RACQ have been doing three to four a day, then as soon as the sun came out, it started sticking," she said. Truck drivers have been forced to abandon their vehicles by the side of the road, and small towns, such as Jaggan, have been isolated while the main road is closed. "It's especially bad for holiday-makers and caravanners who come up for the holidays and are stuck up here with tar dripping up the tyres," Mrs Stacey said. "This weekend is the Malanda Show weekend and the main route for people coming up from down south along the Palmerston (Highway) is blocked." A Department of Transport and Main Roads spokeswoman said the department was working to fix the problem. "We are aware of issues with the recent reseal works at Millaa Millaa-Malanda Road," she said. "The section of road was temporarily closed to all traffic but has reopened two lanes with reduced speeds following emergency repairs." Last week, the bitumen was cracked and loose with gravel due to wet weather affecting the seal, forcing the Department of Transport and Main Roads to put in a temporary reduced speed limit of 60km/h to prevent gravel from damaging driver's windshields while they swept the road.